Get ready to watch Boston Bruins & Montreal Canadiens on New Year's Day! Planning to come watch the Boston Bruins and the Montreal Canadiens in the 2016 NHL Winter Classic at Gillette Stadium on New Year's Day? This match pits the arch-rival Bruins and Canadiens against each other for the first time in the Winter Classics. It also puts Gillette Stadium in the spotlight. 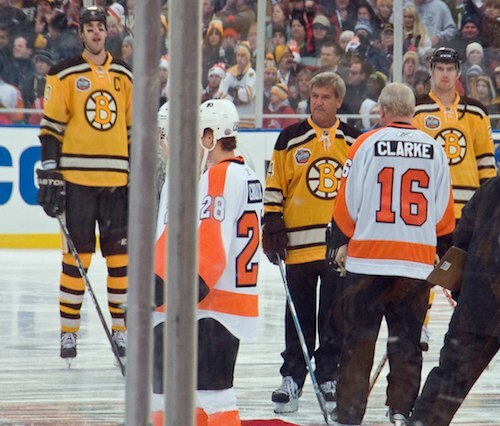 After the previous Winter Classic held at Fenway Park drew huge crowds and massive excitement during the nearly 2 weeks of public and private skating matches and events, hopes have been high for a return. Gillette Stadium, located just 26 miles south of Boston, holds almost 70,000 spectators - roughly twice the number of Fenway Park! Here's a roundup of the 3 most important things you need to know - and do - RIGHT NOW to secure your place at this historic ice hockey event. Winter Classic tickets are already on sale - so get your tickets NOW! But if the pattern seen a few years ago when the Winter Classic was played at Fenway hold true, they will cost even more as the event gets closer. So don't wait to get your tickets! If you are coming to the Winter Classic from out of town, your first decision will be whether to stay at or near Gillette Stadium, located in Foxborough, MA - or in Boston (26 miles north of Gillette). Getting to the stadium by car, bus, or taxi means exiting onto Route 1 - and getting caught in gridlock that can last for hours. During football season, you can avoid this - and the astromical parking fees at Gillette - by taking the special game-day train service from Boston. Will train service also be available for the Winter Classic? Unknown at this time. IF train service is available, choosing a Boston hotel and taking the train will let you avoid Route 1 gridlock. Boston's huge First Night celebration takes place on New Year's Eve. This means that if you stay in the city, you can join the festivities on the night before the game. Boston hotels will be full of other celebrators, so you should make your hotel reservations early. Other hotels near Gillette also have a relatively small number of rooms. Remember ... with First Night and the Winter Classic taking place on New Year's Eve and New Year's Day, Boston hotels will fill up early - so get the best rates and best location, make your reservations now! As mentioned above, the easiest and cheapest ways to get to Gillette Stadium are by walking - but you can count on doing this only if you stay next in the Renaissance Patriot Place - or by taking the special train service from Boston. Hopefully the special train service will be available, but no announcements have been made yet, so for planning purposes, you should assume it won't be. If you are local and have a car, or are arriving in the Boston area by car, you're all set, other than needing a strategy for avoiding gridlock getting out of the stadium - more about that in a moment. Survival Tip #1. 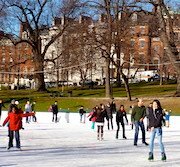 Avoid having a car in the city - If you are planning to spend a few days in Boston before or after the Winter Classic - definitely a great idea, as there are lots of fun things to see and do here - you absolutely do not need or want to have a car in the city. Parking is horrifically expensive, and driving around our narrow streets can be a nightmare (more about what driving in Boston is like). Assuming you stay in the central part of Boston where most tourist attractions, the First Night celebrations, theatres, restaurants, etc. are located, you can easily walk or take the subway (the "T") to anywhere you'll probably want to go. Therefore - use a "just in time" approach to renting a car - pick it up on Friday morning (New Year's Day), drive straight to Gillette, and then return it as soon as you get back to the city - or drop it off at the airport if you're leaving immediately after the game. You'll pay only for the time you actually need the car - and you'll potentially save hundreds of dollars in parking fees. Since this is New Year's Day, call the rental car office (numbers are below) to verify when they will be open. Survival Tip #2. Consider staying close to a car rental pickup - Assuming you follow the advice in point 1 above, you can head over to Boston Logan Airport to pick up your car on January 1st - a water taxi will whisk you across the Harbor to the airport in less than 10 minutes (more about water taxis), where you'll find all the major car rental companies. 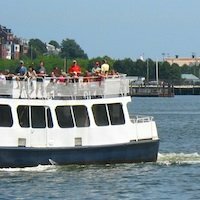 But, even easier, stay in a hotel next to one of the city rental car pickup offices, and you'll save time and the cost of the water taxi. You can find more information about Boston rental cars here, including information about Zipcars. Also, here is some additional information about getting to Gillette Stadium from Boston - although most of the points have already been covered here. As already mentioned, Route 1 goes into gridlock mode once any Gillette Stadium event ends. So, you need to decide: do you want to sit in your car, fuming - or should you hang out for awhile near the stadium and enjoy yourself after the game? 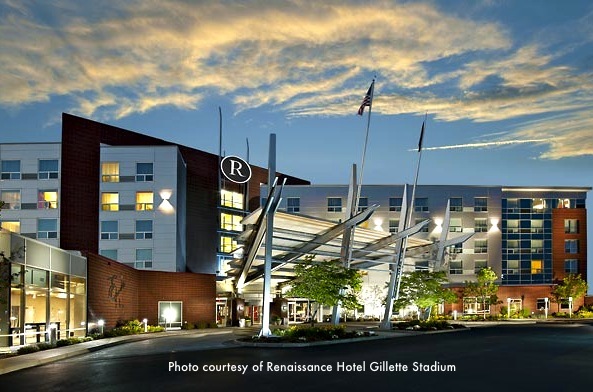 Gillette Stadium is located in Patriot Place, a shopping/entertainment center with a large number of restaurants and bars. You'll find plenty of places to kick back and relax. Just remember to have a designated driver with you if you spend time in the bars. If you're staying in a hotel near Gillette Stadium, be sure to check out the OTHER big attraction in the area: Wrentham Village Outlets, about 10 minutes away from the stadium. Wrentham Village is the largest discount shopping mall in the Boston area, and boasts an enormous range of brands ranging from budget to luxury. Savings can be significant - especially if you hit the after-Christmas sales. If you live outside of Massachusetts in a state or country with high sales tax or VAT, you may get another type of big savings: no sales tax on clothing priced under $175. Just be aware that stores may not be open on January 1, New Year's Day - so check before going. If you're staying in Boston, don't worry - you can find many of the same stores in another outlet mall, Assembly Row. Spending New Year's Eve before Winter Classic at Boston's First Night - Best hotels?